Anyway, here’s some culture we’ve consumed recently. Liz especially wants to get her ramble on. The Invisible Guardian, Dolores Redondo. I encountered this work because I attended the totally amazing Modern Mythologies panel at Melbourne Writer’s Festival. She was on a panel with Samhita Arni. Both authors have used their personal cultural mythologies to rework/look at crime fiction. Although The Invisible Guardian sadly breaks my ‘no books about the murder of dead ladies unless the dead ladies are investigating’ rule, opening immediately with the death of a lady, this was such a great and different way of approaching a murder mystery. The main character is a lady detective, she’s dealing with sexism in the police force but also childhood trauma and also the conflict of professional versus this vague desire to procreate, mobile phones are correctly used to high effect, and I didn’t guess the ending. Good work, everyone! Also it’s set in the Basque region of Spain and translated from Spanish, so there’s a whole lot of cultural elements in there that I was unfamiliar with and had to go research, and the style of writing was quite different from the murder style I’m used to. So that was also excellent. Brooklyn Nine Nine. I just really love this. It makes jokes that aren’t (usually) punching down, it talks explicitly about racial prejudice, the actors talk explicitly about racial prejudice, also it’s really funny. Sometimes I laugh so hard I almost fall off the couch. Bikenomics: How Bicycling Can Save the Economy. Elly Blue. I love bikes! I love getting around on bikes! I dislike a lot of the language around bikes, the way cycling is considered a thing men do, and the way Super Tuesday commuter surveys take place solely between 0630 and 0900, thereby giving biased results through excluding a whole lot of cafe and hospitality workers, cleaners, part time employees, people involved in school drop offs, and other people who may also commute but don’t do it during office worker time. So anyway, this is a really great overview, including references, stats and advice, on why cycling is good for the economy and for cities and for you, and how those things are achieved. It even talks about gender, class, socio-economic and racial issues within it, hooray! It is very American-centric though. Hoo, boy. I’ve read some amazing books in the last few months. This is your standard YA dystopia: children are divided at birth into one of two genders, sent to institutions to be socialised and educated to conform to the standards of a society in which corporate interests influence democracy and the powerful prey on the weak. What I loved about these books — in addition to the characters, the humour, the angst — was how big the worldbuilding is. This is very much a Canadian duology, but Canada isn’t the centre of this universe. There’s room for other nations, even before book 2 introduces international dragon slayers and the Canadian exploitation of Filipino workers in the dragon industry. This is assuming that you have an Australian or US Kindle account to start with. Obviously there are very real issues with Amazon and its treatment of staff and authors, but it’s the only store where I’ve had any luck accessing books that don’t have Australian distributors. Click on the “change country” button. Click save, humming “O Canada”. Now, several years ago, Amazon had an unfortunate habit of wiping your purchases whenever you changed countries, so that if you switched, say, from the US to UK, all your US purchases were removed from your device. This is no longer the case. All of my US purchases are still on my Kindle (that is, in my Kindle app on my iPad), and I can still read them simultaneously with my Canadian purchases. Things No Award loves: dystopias; climate change; excellent worldbuilding based on long-term climate change; artificial intelligences; queer romances. Things The Scorpion Rules has: ALL OF THIS. I cannot tell you how much I love the worldbuilding in this book. The need to give up the children of world leaders as hostages means that a whole lot of places become constitutional monarchies, because who is going to run for election if it means exposing your kids to that? But the US — what remains of it, tiny little fragments of nations — clings stubbornly to republicanism, more or less, so Elian arrives completely unprepared for the life that the rest of the hostages have been raised to take for granted. But this is not a case of “everything changed when the heroine met a boy”. I mean, it is, but not in a romantic sense. If you’ve ever thought, “YA dystopia is great, but what it needs more of is princesses wrangling goats and falling in love”, well, this is the book for you. I can’t tell you how impressed I am with Canadian speculative YA right now. Canada and Australia are where it’s at in terms of great books for teen readers these days. Disclaimer: I am friends with Amie and know Jay through her. But even if they were complete strangers, I would recommend Illuminae. It’s been heavily hyped, but it’s totally worth it — a tense space opera told through found documents, with a spiky, compelling heroine and (yes!) a malfunctioning AI whose concept of the greater good is … problematic. Daredevil. My feeling about this Marvel series is pretty much the same as my feeling about the Daredevil comics: this is all nice, but wake me up when Elektra appears. I was pretty unimpressed with its racism, particularly where the Japanese and Chinese characters are concerned. Madame Gao is nicely fleshed out, and will apparently return for the Iron First series, but overall, the portrayal of Asians is straight out of a 19th century yellow peril pamphlet. On the other hand, the showrunner did try to get an Asian actor to play Stick, and French-Cambodian actress Elodie Yung has been cast as Elektra, so maybe it will improve? Probably not, though — Elektra is still meant to be Greek (no one ever casts Greek women as Greek heroines/villains because anglocentricity and latent anti-Mediterranean sentiment, see also Wonder Woman) — and the Marvel universe is traditionally terrible when it comes to Japan. 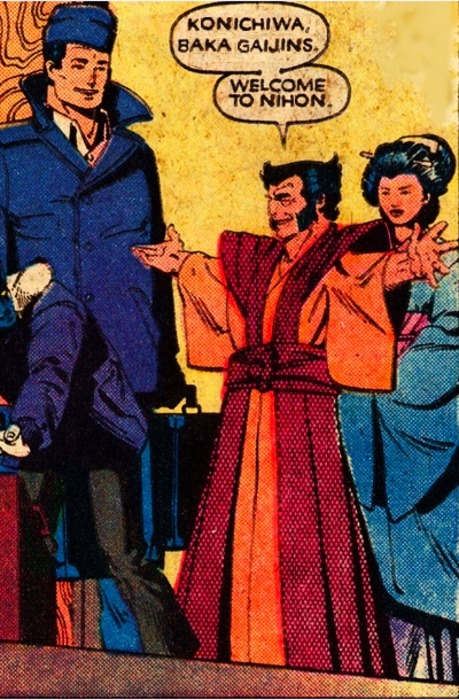 This panel is photoshopped, but it’s so reminiscent of Marvel’s actual approach to Japan that it fools a lot of people. It does make me eager for Jessica Jones, despite my fears that it will be as rapey as hell, and, like Agent Carter, ultimately more concerned with the male characters than the titular heroine. Unlike Stephanie, I used to have a crush on David Tennant, but his fans en masse are awful, and it’s a matter of when, not if, his character is woobified. And, I guess, whether he’ll be lovingly depicted killing Madame de Pompadour or River Song before he’s redeemed by the love of Rose Tyler.